It has been a while….yes but here is a weekly shoe to get things rolling again. I’ve had my eye on these puppies for a while, how could you not they’re so dazzling! 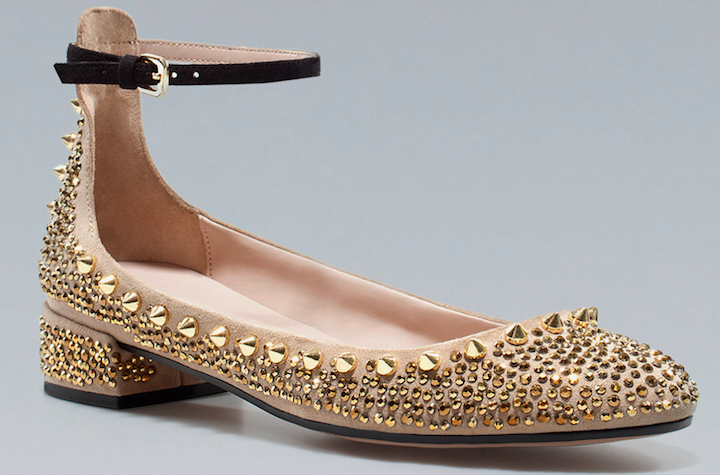 I also have to say, Zara can make a $79 pair of shows look like a $799 pair! I’m sure they fit like a $20 pair of shoes and peel off your first epidermal layer after a few blocks but…just look at those magic sparkle flats! I love the fast fashion world! This entry was posted in NOTES and tagged bedazzled, gold ballet flats, zara. Bookmark the permalink.